It took me 20 minutes of customer service frustration to get here. I'm at 35,000 feet, online on my Chromebook, proving that the technological limitations of the stateless future are falling by the wayside. Reliable, fast internet access anywhere you are is growing fast, but no one would argue that we're all the way there...yet. I began signing on from the airplane to write a "see, being on a flight doesn't limit your use of a stateless device, because you can connect to your cloud data and apps almost anywhere" article. But something happened along the way that changed the direction of what I'm reporting today: Gogo, the inflight internet service provider, once again made my experience of buying their service so frustrating that it made me think the following: all the improvements in technology in the world are useless until businesses recognize that things have changed, and deal with their customers accordingly. Here's the story. I fly American Airlines pretty much exclusively, and Gogo service debuted on their widebody coast-to-coast flights three years ago. I know, because I checked my account history with them, and my first use was in 2009. It's gradually expanded to more routes and more plane types, so that this flight, Fort Lauderdale to LA on a 737, is WiFi equipped too. Despite all my hours in the air, I've only used Gogo 5 times, including this one, because every single time I've tried to buy their service, their billing system and my credit cards have fought a battle, ending basically with me getting the message, "computer says no." Sarah: Welcome to Gogo. My name is Sarah. Sarah: Hello Donald. I'm sorry to see that you are having trouble purchasing. Are you receiving any error messages? Donald Ham: Hello. Can you help me figure out why Gogo is so determined not to get my business? Donald Ham: I haven't even tried for over a year because this has happened EVERY time I try to use Gogo on a flight. Sarah: Are you receiving any error messages? Donald Ham: First it declined a credit card, despite the card being fine and the data accurate, then when I tried a second card, it said something like, "we cannot log you on, try again later." Sarah: Okay. This may take a few minutes to fix, but please stay with me and do one step at a time. 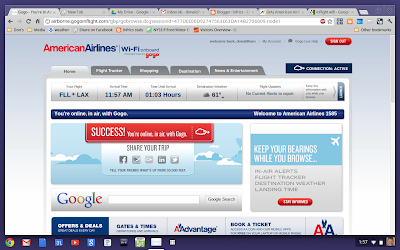 First, please redirect a browser to http://air.gogoair.com. Let me know when you are able to access that page. Sarah: Does it say to Sign In, or Sign Out, at the top of the page? Sarah: Please go into the 'My Account' section and delete the saved credit card information. Do not re-enter any information. When you have deleted the information, please log out of your account and close all open browser windows except this chat. When you have closed them, please let me know. Donald Ham: Done. Card deleted, logged out, you are the only tab open. 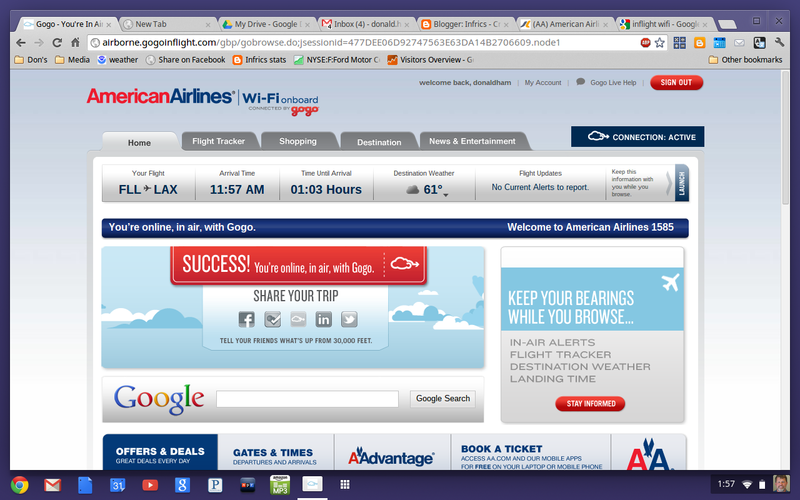 Sarah: Next, please open a new browser window and manually enter http://air.gogoair.com. From there, please log back into your account and try to make the purchase again. Please let me know if you receive another error message. Donald Ham: It worked. WHY does Gogo do this to me every time? As you can see, my first access was in 2009; I was one of your first users. But I avoid it almost every flight because I am so tired of fighting Gogo's efforts to make this awkward and time consuming. WHAT is going on? Sarah: I'm unable to view credit card information for security purposes, so I cannot verify what the specific issue is. Donald Ham: Who can? I am a tech blogger, about to go on my blog and Twitter to talk about this experience? Does anyone at Gogo care about customer experience? Sarah: I'm sorry, but we none our agents have access to credit card information for security purposes. It may have been an issue with how the information was entered, or that they system was unable to recognize the information. Donald Ham: I heard that the first time. Who in your organization has the power to respond to my concerns? How do I contact them? Sarah: The only information that I can see regarding your payment issue is that it says 'Do Not Honor'. Since after you deleted, then re-entered the information, the card was processed, there may have been a discrepancy between the information on your card and what the credit card company has on file. Donald Ham: That is no longer my question. Who at Gogo has the power to respond to an upset customer, one who is about to use the power of social media to share his bad experience with thousands of people? Give me a contact e-mail or phone number. Sarah: You can contact Steve Vair at svair@gogoair.com. Donald Ham: Thank you. I will do that. I appreciate your time, and will now close the session. Sarah: Thank you for choosing Gogo. Fly classy. At this point, Infrics.com themes have just merged. The initial effort was to use a tech advancement (inflight WiFi) to show the brave new tech world of stateless computing. But the "era of you" part of the future stepped right in and hijacked the dialogue. Gogo, for all the magic bringing the ability to go on Facebook while high in the air, does customer service like a company in 1999. "LOOK! We have live online chat!" At the point "Sarah" entered that gratuitous "fly classy" remark, she cost her company a fortune in lost good will and future business. By thinking they will save money with level one customer support, and make unhappy customers go away by offering boilerplate responses, Gogo and many others fail to understand the growing expectations of consumers to be treated individually, and their (exponentially) growing power to share their experiences with the world. My conversation with Gogo is "United Breaks Guitars" writ small, but it reflects the same head-in-the sand business attitude. Remember, the youTube video about United's bad customer service has been viewed nearly 12 million times, and is estimated to have cost the airline one billion dollars in lost revenue and goodwill. Social business behavior needs to extend down to your lowest point of contact with your customers, or it's mostly worthless. CRM (customer relationship management) must be pervasive, accurate, highly granular, and central to your dealings with customers. You have the power to know them as individuals, treat them as valued assets, and put them to work as your greatest marketing agents. If you fail, they can easily become your biggest enemy. Customer service is a field just begging for the implementation of AI (artificial intelligence) to replace level one support with a computer interface that is heuristic, has access to every customer interaction, and escalates quickly to the right live human. The day is coming--trust me on this--when you will far prefer a great experience talking with a computer intelligence to one with an entry level person with no power beyond looking up canned answers in a book. I still believe it's totally cool how pervasive internet access is already. But when it comes to airplane service, I sure hope Gogo learns to treat customers better. Or that they're put out of business by someone who does.